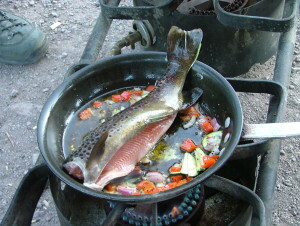 OK, so you can’t have this for dinner in the field every night. There just aren’t enough fish in the state, and who is going to give you the fresh-picked veggies anyhow? So, when the rural eatery becomes your best option, where do you go? When you travel afield often, you get a pretty good idea for where to eat out when you come back to town. Nothing tastes better than real cooked food after a few days out beating the bush. In fact, those salty field hands among us already know the real secret to keep field crews motivated for weeks on end: bring your own camp cook, and make sure they know what they’re doing. I certainly found this to be the case in my time in Alaska, and it is true no matter where you go. The problem with doing research out of a small lab with just a couple of students is that unless your project has a predictable long-term field campaign, it’s hard to hijack a worthy biscuit roller and get the vittles planned right. That makes trips into town every few days a worthwhile adventure. Nevada is a spread-out place when it comes to settlements. Get away from the Interstate corridors and most towns are separated by 1-2 hours of highway travel. Given the short list of places to choose from, every Great Basin field hand is going to have a variation on their favorite spots to chow. I’ll list a few of my own, scattered around the central part of the state, that never let me down. I’ve got no problem driving an extra hour to get to these places. They’re not all low-cost, or “bang for the buck”, just the spots I happen to like (and in no particular order). Oh man. Basque style at it’s best. Open FR-SA-SU only, and not cheap if you get the full dinner. But you’ll have lunch saved for the next day. Sort of an out-of-the-way secret (but good word gets around). Really at the top of my list, I will go pretty far out of my way if scheduling allows to hit the Heydey. They make their own salsa, and it’s pretty good stuff. Always get a good meal in here, and they have the BEST T-shirts. Nevada food, the way you expect it, for as long as I can remember. For breakfast, I get the waffles. Back when I was younger, there was a old bar at Cold Springs that didn’t leave any positive memories. That place burnt down some time ago, and a fresh new Cold Spring Station was built a few years later. The new version is decidedly worth stopping at, excellent sandwiches and atmosphere. It’s right between Fallon and Austin on US 50, so it’s just about the right place for a lunch/dinner stop on a drive back to Reno from Ely. Carol and Karl have only been open for about 5 years, but they put Beatty back on my map as a place to stop for food. While they will make decent pizza and so forth (and I have called ahead with pizza orders before), their real specialty is the variety of completely home-baked everything sandwiches, right down to the bread. Toss in a generous slice of red velvet cake, and you can’t lose. Sorry, this is a trick entry. The Lytle’s aren’t exactly open to the public, but apparently retired scientists are killer gardeners. We’ve had some of our best field meals after dropping in at Farrel & Manetta’s. Squashes, sweet peppers, hot peppers, melons, cucumbers, tomatoes, tomatillos, grapes (2 varieties), and amazing corn are all apparently no problem to grow in eastern Nevada with the right knowhow and dedicated care. Goes to show that you never know who you are going to meet when you stop and look around in rural Nevada! 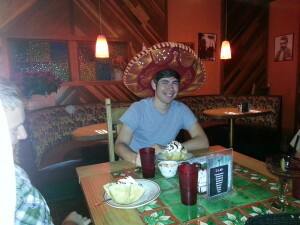 It’s somebody’s birthday at Margarita’s! Cue the fried ice-cream! I’m not going to claim that it’s like Mexican food a little farther south, but for up in our neck of the woods it’s pretty darned close. Margarita’s is the place out by the airport, and it’s worth the few extra minutes out of town if you’re staying local. Very authentic plates and killer fried ice-cream if you’re after some extra calories. Also, the top-shelf margaritas really are top-shelf, at least according to Naked Ben. Fine. Even though the menu/portions/management has turned over a couple times in the restaurant in the last few years, we still really like to stop in. There used to be some killer local deals (early-afternoon $5 prime-rib BAM!) that sadly are no longer, but even so it’s classic Nevada food in a classic atmosphere. Hotel Nevada is definitely an institution, and the rooms are cute and fun to stay in if it’s snowing outside. This little Bed & Breakfast-style joint has a classy bakery that isn’t to be missed, as well as excellent steak dinner fare if you find yourself in the neighborhood. Really a great spot in the middle of nowhere. While not exactly out in the middle of nowhere, this family-style Basque spot is one of the few really good examples of such left in the state. The JT is not particularly pricy, but the food quality is way above par. If you are in the neighborhood for lunch or dinner (check the hours), you can’t lose. My wife’s favorite place. Do you have a favorite rural Nevada place to eat? Post it here in a comment!